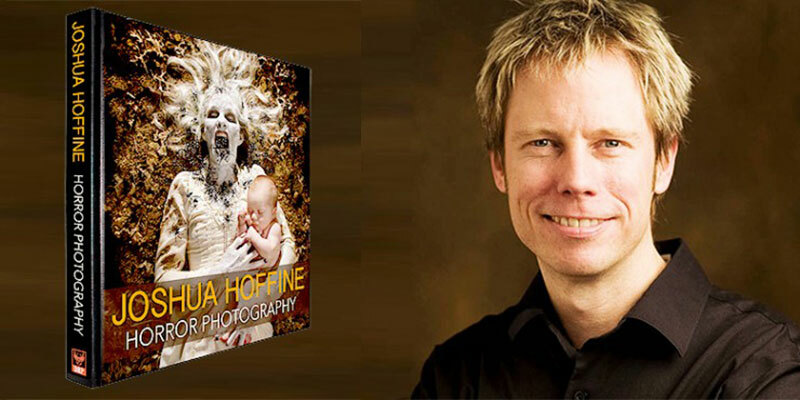 Horror Photographer Joshua Hoffine uses real movie sets, special effects and even his own daughters to create haunting scenes from your nightmares. 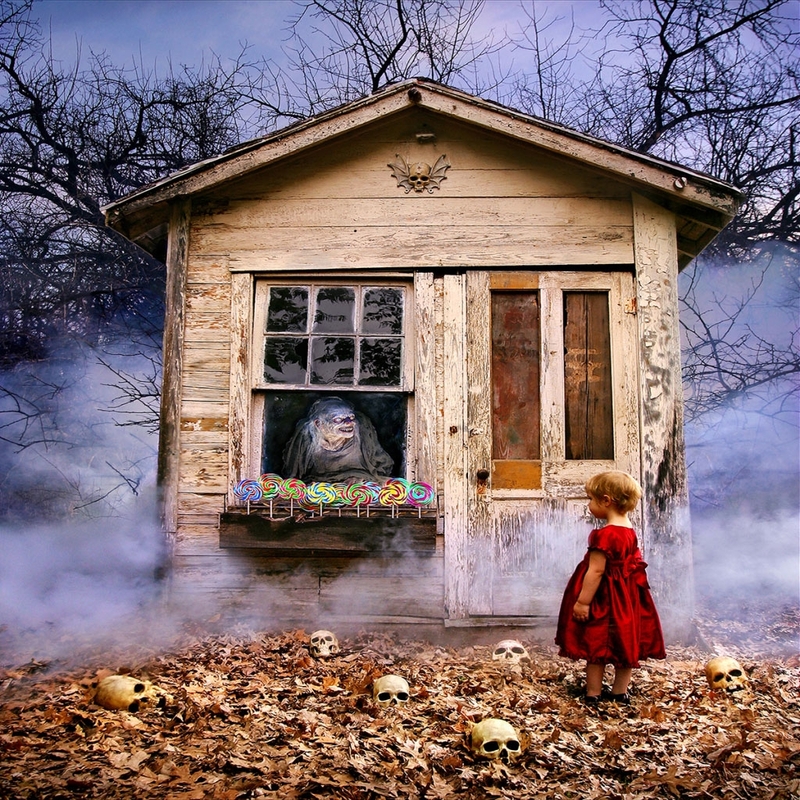 Joshua Hoffine first came onto my radar a few years ago with his horror photography spread based on childhood fears. What made his work stand-out was that he used real children. And real sets. And real effects. They were terrifying, and reproduced these fears quite exquisitely. As an avid horror fan himself, his passion is perfectly captured. It wasn’t long after that, that I discovered Hoffine was the artist behind one of my all time favorite photos, the beautiful and brutally bloody, Lady Bathory. So you can imagine my excitement when Hoffine agreed to an interview. I asked him about his work, filmmaking, and what we can expect next. 1. You’ve been described as a pioneer in the sub genre of horror photography. How did you get your start with photographing horror? I love the Horror genre. I have since I was a kid. At some point, I noticed that there was no such thing as ‘Horror photography’. There were Horror movies, and novels, and comics, and video games, but no Horror photographs. So I was inspired to create still photographs that functioned like mini-Horror films. I have 4 daughters. I started working on this project when they were young. I noticed that they were experiencing the same fears that I had experienced at their age. Noticing this was my second inspiration. As a result, my first Horror images dealt with the type of universal fears we all go through as children. I became focused on the psychology of fear. 2. Looks like your daughters have a lot of fun being the models for your photos. How do they feel about it? Does it ever give them nightmares? My daughters enjoyed helping me. For them, it was like a big game of dress up. They were proud to be the stars of these images. My daughter Chloe would smuggle prints into her grade school to show her friends. 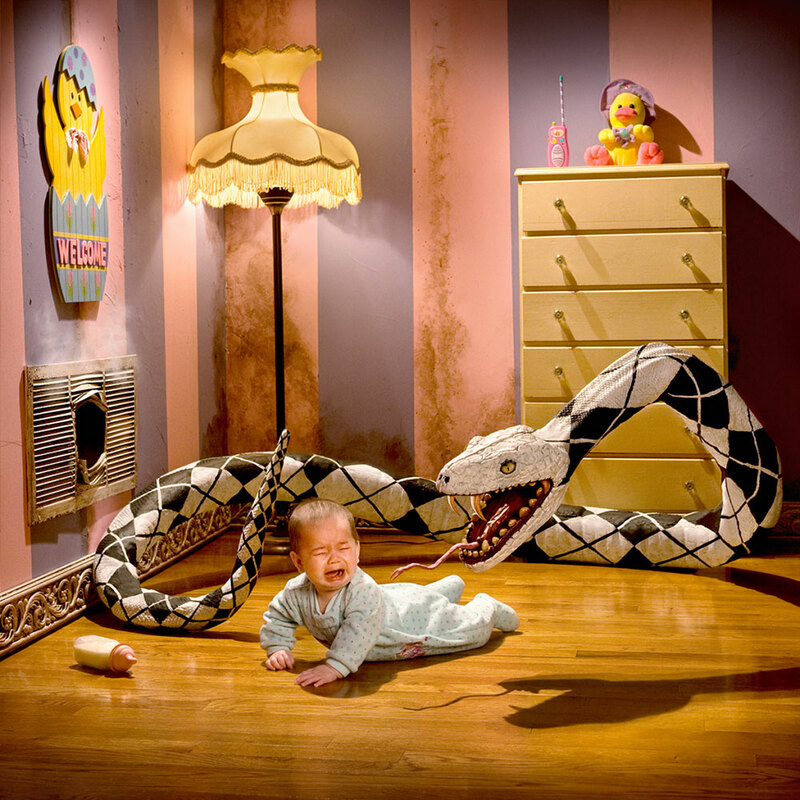 Being involved with these photo projects did not give them nightmares. Typically, these projects touched on fears that they were already experiencing. Now these fears were being turned into a fun project with Dad, defusing a lot of their power to frighten. If anything, the photo projects seemed to make them braver. 3. You use film-like sets, practical effects and your photos are very detailed. Where do you get your ideas, and what’s the process like? I seek out archetypal ideas and characters – fears that we are all familiar with. The more universal the fear, the better. That can be anything from the monster hiding under your bed, to a lunatic breaking into your home. I prefer to photograph things practically, using SPFX make-up and sets, rather than creating images digitally. Because of this approach, projects can be expensive and take weeks to prepare for. 4. I read in Girls and Corpses magazine that you are currently working on a film, and you’ve made some shorts. What made you transition from photography to film? I have certain ideas that will only work with moving pictures and sound. I want to retain the same aesthetic developed in my photography, but expand upon it in film. 5. Can you tell us anything about your film project? It’s a slasher film. But unlike any you’ve ever seen. 6. You recently released a book of your photography. Do you have any new photography projects on the horizon? My recent hardback book of photographs with Dark Regions Press represents 13 years of work as a photographer. Publishing the book was a personal finish line for me. So right now, all my efforts are focused on the movie project. I hope to shoot another big photo project some day in the future. I have developed a lot of material based on The Grand Guignol, and another project based on modern real-life fears, such as plague and mass-shootings. We’ll see. Movie first. 7. What’s your favorite scary movie? I worship so many, but if I had to pick just one favorite I would say Poltergeist. It was a big deal to me and my sisters growing up. It is a great movie, and as a child of the 80s, it’s strongly infused with a sense of nostalgia for my childhood. 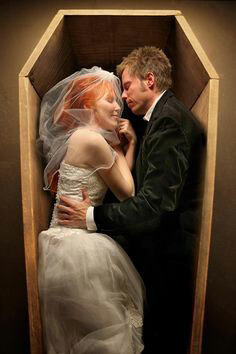 Check out the short film, Black Lullaby, from acclaimed Horror photographer Joshua Hoffine. The film is about a curious young girl and her encounter with the Boogeyman. The suspenseful film continues the lush visual style featured in Hoffine’s photographs. You can watch it here.